The Museum of Indian Arts and Culture (MIAC) is commemorating the 150th anniversary of the signing of the Treaty of Bosque Redondo, signed June 1, 1868, by displaying an extraordinary wool rug woven in tribute to the Long Walk. Whether you couldn't make the presentation or you really want to go back and hear it again, these recent lectures on Native American Arts & Culture are available for download in MP3 format. 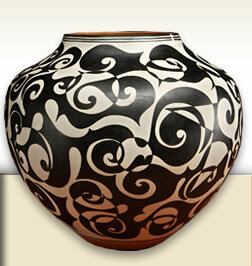 Showcases the life and work of Maria Martinez, the legendary San Ildefonso potter who forever changed the world of Indian art. This introductory video features members of the museum's Indian Advisory Panel discussing the role of Native people in the operations of the Museum of Indian Arts & Culture.